Paper will not trap moisture to cause metal evidence to rust or biological evidence to spoil. 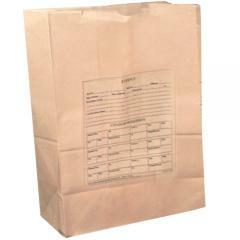 The paper industry classifies these bags as Super Heavy Duty and they do not easily tear as some recycled bags do. The Style 25 bag is the next larger size. It is a good size for holding a pair of shoes, a pair of pants, or a medium-size radio. This bag is 8 1/8 × 6" × 15 ¾. These bags are just what I was looking for and I am glad I found them on Cops Plus. This is the first, but sure will not be the last time of me ordering stuff from here. Thank you for your great quality of service.